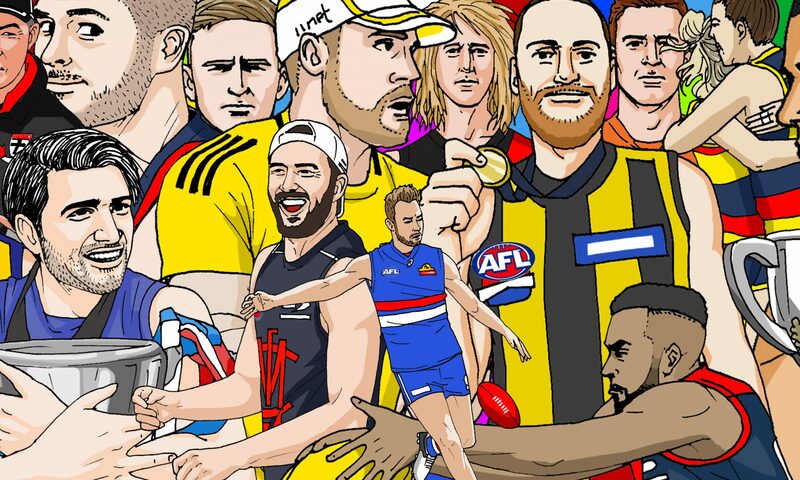 We’ve started a series on AFL’s forgotten players, legends, characters, overachievers and underachievers. To catch up, you can read Part I. Here’s Part II. If there are players you want us to write about, email us at: thefiftyfooty@gmail.com. Digby Morell: He didn’t play many games between his two clubs but he definitely won the ‘Looks Like a Tradie’ award by a metric landslide. Ol’ “Diggers” had a brilliant mind for the game and a glorious receding hairline that would make Lebron James look twice. He is now a Phys-Ed teacher in Melbourne. I’d be stoked to learn from him. Jack Anthony: I love to reminisce with the Magpie diehards who claimed this guy was going to be the next big thing. I’d hear things like “he’ll kick 70-plus goals in a year”, or that he’d eat blokes like Josh Gibson for breakfast. I will admit that in 2009 he looked pretty good in a strong Pies team. He kicked 50 season goals and got Collingwood into the Preliminary Final by slotting the match winning goal against the Crows. I’ll always remember him as the bloke who headbutted Scott Thompson (the North variety) in the nads. Darryl White: White played in all three of Brisbane’s premierships providing superior ball handling, a decent leap and an ability to play tall on some tough opponents. His isolation and rebound off the half back line had opponents wondering just where the hell he’d come from which I greatly admired. He once tore ligaments in his left knee due to stepping in a rabbit hole while coaching Outback Queensland. Come on, Darryl. Corey Jones: Despite having his breakout 46-goal season on a third-placed Roos team in 2007, injuries caused him to miss the finals that same year. I once saw him kick a bag of seven goals against the Hawks in Launceston. He was glorious when on song but was usually accustomed to being North’s favourite whipping boy. Despite the odd grumble and moan I mostly loved the guy. He was an honest trier. Setanta O’Hailpin: The most vivid memory I have of the former hurling player, was when he clubbed the living peanuts out of then teammate, Cameron Cloke, at an intra-club match. O’Hailpin never really lit the world on fire so this feat is surely no.1 on his personal highlight reel. Martin Pike: I loved the fact that Pike’s career can be best defined as ‘right place, right time’. Not many who play AFL have lived through a career quite like Martin Pike. For me, I’m torn between thinking whether or not Pike is either an average player who got the most out of his career or one of the luckiest footballers in the modern era. Not doubting his ability as a useful half-backman-turned-wing but let’s be fair: the bloke ended up at the Roos because Fitzroy Lions folded. Then he won a flag. We know the rest. Buy a Keno ticket, Pikey! David Rhys-Jones: The former South Melbourne-Sydney and Carlton utility might go down as one of the biggest thugs to grace our game. Doctor Jay was the man you loved to hate and was probably reported more times than any other player in history: he missed a grand total of 22 games due to suspension over 12 years that included 42 tribunal appearances (including those as a victim). Although his resume may have said “Professional Footballer” we all know that he actually chucked cut lunches for a job.